The spice jar contained exactly two. What would I do with these precious culinary gems? Creme brulee? Panna Cotta? I pondered many options but in the end I decided to pair them with one of my other all time favorite things in the world (that I happened to have on hand! ): peaches! Vanilla Peach Jam to be precise. I perused many recipes and picked and chose what I liked. This is generally how I cook. I can’t seem to leave well enough alone. I must play. So this is what I came up with. Most recipes called for MUCH more sugar than what I’ve put together. Even though I cut back slightly on the first round of this recipe it still seemed too sweet. I cut way back and the results are nothing short of heavenly. (Am I allowed to say that?) I will admit that I may have had to “sample” this quite a few times as it cooked down…just for quality control, you understand. Okay, truth be told, it was so good that it’s kind of a miracle there was enough to put into jars. 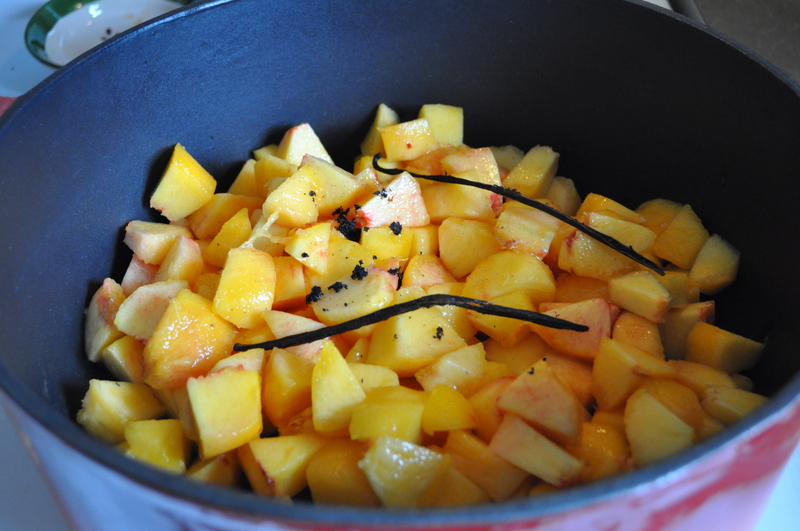 Put the peaches, lemon juice and 2 cups sugar in a heavy bottomed pot or dutch oven. Slice vanilla bean in half lengthwise. Use the flat side of a knife scrape out the seeds and place in the pot along with the empty pod halves. Bring to a boil, then reduce to simmer. If using, add the Bourbon. I’ve made it both ways and it is delicious with or without. The Bourbon serves to enhance the flavor of the vanilla, much like adding coffee or espresso to chocolate recipes. Simmer for about 1 1/2 hours. Stirring occasionally. 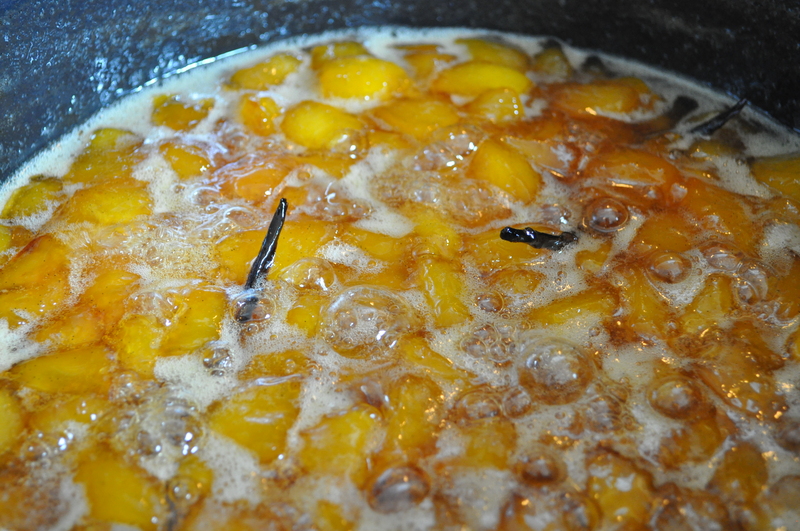 The peaches will turn a golden, caramelized orange color. Allow to cool slightly and ladle into jelly jars (discarding bean pods). When cooled completely store in the refrigerator. It will continue thickening as it cools. If you’re into canning, you could certainly do the whole canning thing with this, but it doesn’t last long enough in our house to worry about needing a longer shelf life! Spoon some over plain, nonfat Greek yogurt. Spread goat cheese over a piece of toast, then top with Vanilla Peach Jam. Warm and serve over vanilla ice cream. Oh – and just a friendly tip – You can order vanilla beans online for much cheaper than you can get them at the grocery store! I’m definately gonna try this. I have vanilla beans just waiting for me to use them. Oh good!! I need to order some vanilla beans from amazon. There are so many recipes I want to try with them! I know I’ve seem them at Costco but that must be at the holidays because I haven’t seen them there in a while. Let me know how the jam turns out when you have a chance and we hope you ENJOY the wedding!! I live in Central America and can’t get fresh peaches….. do you think that this would work with canned peaches?? I figured not having to cook them as long, and drain and rinse well before using (to get all the syrup off)….. What do you think??? I think it would have a different texture because canned peaches have such a different texture than fresh. That said, it doesn’t hurt to give it a try. Having grown up overseas and knowing what it’s like to not always be able to find ingredients you want I would be very curious to hear how it turns out. Please let me know how it goes if you give it a try! Good luck! I’ve seen recipes using frozen peaches. Just let them thaw. I have some in my freezer and tomorrow they will be jam. I was thinking about using frozen peaches. If I want to can some like this would I do it the same way?? I made this recipe and did can it using a water bath canning method. I left it in the bath 20 minutes. All the jars sealed perfectly. I am on the second jar and all seems well!! This is such a delicious recipe. Mine never thickened, kind of a bummer. Can u use cherries instead of peaches ? I would imagine it would taste divine with cherries! Just adjust the amount of sugar for how sweet you want it (which will also depend on how sweet your cherries are). Let me know how it turns out! With cherries you could also try almond flavoring. I live this! Can’t wait to try this recipe, I have a bunch of peaches on hand. Plan to can it, too. That said, I do have a question. I noticed that this recipe does not call for any fruit pectin. Will the jam still set right and last without it? I see that you mentioned to discard the vanilla pod, does that include the beans too? I have vanilla beans/pods coming tomorrow. This is the first time I will have ever used them., so I am unfamiliar with how big they are. 🙂 Did you crush yours? In the picture they look so tiny. How fun!! Depending on what kind of vanilla bean you ordered they are anywhere from 6-8 inches. If you check out the recipe I mentioned above you can see the empty “shell” of the pod behind the knife with the caviar on it. It’s not crushed, just scraped clean of seeds. For future reference (and you may not need it, I just thought I would pass it along! ): beanilla.com does a great job explaining the different types of vanilla beans. Sometimes they have good sales. I’ve ordered a large quantity before when they are on sale and split it with a friend. It was totally the way to go. Thanks for checking out the site! Have fun!! You make me want to get out some vanilla beans and cook with them! Peaches are in season again after all! I made this last week and it was absolutely divine!!! Upped the bourbon a tad and used vanilla extract(couldn’t find beans). I also didn’t cook as long, so that it wouldn’t set like a jam, just peaches within a yummy syrup. So decadent and a perfect topper for ice cream our pound cake. Thank you for this recipe!!! Oh GOOD!! You’re welcome! I’m so glad you loved it. Wonderful idea to keep it a looser sauce as a fun topping. 🙂 Thank you for stopping by, trying out the recipe, and for the feedback! How many jars did this make? This looks absolutely amazing! I am wanting to try this but I was wondering how much vanilla extract would you use instead of a vanilla bean? Thanks! I’ve heard that 1 good quality vanilla bean is the equivalent of 3 tsp of pure vanilla extract. Happy cooking!! what does the lemon juice do and is it absolutely necessary? The peaches will turn brown without it. If you are canning you will also need acid to preserve. Just made 2 batches. One the regular recipe but I used whiskey since that is what we had on hand and the other I switched up. 1 cup brown sugar and 1/2 cup white, 1/4 cup whiskey and the vanilla pod from the last batch plus a fresh one. I cut the peaches way smaller so I used more of them. Batch 1 is very vanilla and sweet the alcohol is a nice finish. Batch 2 is very peachy and less sweet. Both are awesome. Since I do can all I do is pour it into sterilized jars while the mix is very hot and put the lid on press down and screw the top on without moving the seal. If in the morning the button is sucked down I know it’s good. Easy easy easy! Do you peel the peaches? If not, what is the texture ? Great! Have fun! I look forward to hearing how it turns out. Just finished my first batch. I purposely peeled the peaches by hand and saved the peels for my green smoothies made in my Vitamix, nothing went to waste! I used only 2 cups of regular sugar and the rest of the sugar I used my “home made” vanilla sugar. Tasts great! I cooked for 1 1/2 hours on low, it seemed thick then put in jar while hot, left on counter to cool. Then I heard the lids pop! Is that normal? They are in fridge, can’t wait to see if it is thick enough. I also went out to purchase more jars. Has anyone seen the automatic jam maker by Ball? Might be good for someone who does a lot of jam. Ok, the filled jars have been in the fridge over nite, and they have not thick as I would have liked, or should say, like store bought kind. What do you think went wrong, any advice please. I’m sorry!! One time that happened to me and I think I had it on a lower simmer. It just hadn’t simmered down as much. This last batch I made is very thick. It actually only took an hour of simmering/rolling low boil. The batch that wasn’t as thick I used it as a topping/sauce for ice cream, cottage cheese pie, or cheesecake. It was great for those uses. So, I though I would go out and buy Certo pectin for my future batches. In reading the instructions they said reducing the amount od sugar (which I did) could result in a looser set. This could have been the problem. I will conquer this yet! Aaahhhh. 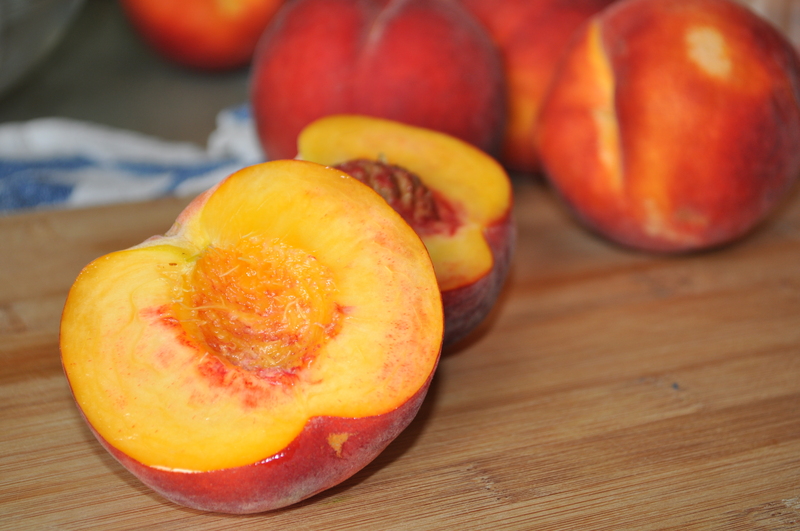 I made a completely sugar free peach “butter” this summer that is SOOOO good. I had the SWEETEST peaches! I had intended to add raw honey at the end after it cooled but it didn’t need it at all. Because it had no added sugar I knew it wouldn’t keep as long so I froze it to pull out and use in the winter when I am missing summer produce! It’s basically just cooked down chopped and crushed peaches with a small amount of lemon juice, then blended with an immersion blender. I reduced it like you would an applesauce. If you’re looking to use less sugar, you could go that route and make a peach butter instead. If you DO add raw honey at the end just make sure the puree is completely cooled first as heat destroys the good enzymes in the raw honey. Good luck! I’m sorry, I’m not familiar with using ball jam makers so I’m not sure. If you give it a try I’d love to hear how it turns out! 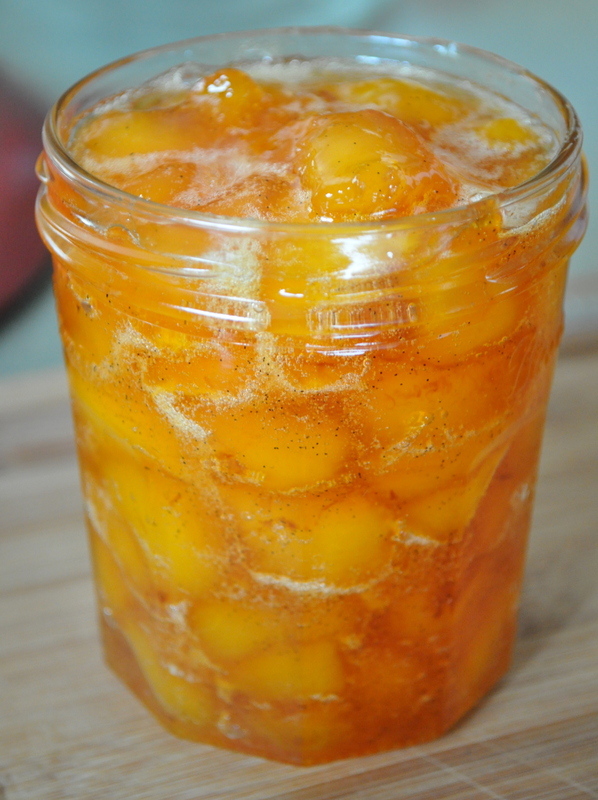 I have a ton of frozen peaches that I don’t know what to do with- do you think they would work in this jam recipe?? I really had not idea so I did a quick google search and found several sites that say you CAN and it should turn out great. Good luck!! I hope it turns out well. Thank You for going the extra step & looking this up, (and for a great recipe!) I can’t wait to try this! I made this last summer along with other jams such as blueberry, strawberry, ect… This was my husbands favorite. He has told everyone in the past year I made some really good peach jam. Of course its been long ate up for months. Husband walked through the door yesterday after work…. with a huge bushel of South Carolina peaches and said lets make some of “that” jam. That DOES sound good! I’ll have to try it with the Amaretto. Thanks for the tip and the feedback! I’ve never tried it without peeling but I suppose you could try if you like it that way! I know this is an old post but wanted to comment that I just made this. I doubled the recipe and did water bath can it. Made it just as the recipe described, except for substituting 3t vanilla extract for the bean (used what I had on hand) and I did boil it for about a half hour longer. I wanted to make absolutely certain that it firmed up (this was my first time not using pectin in a jelly/jam recipe and it made me a little nervous) and it just didn’t look “right” after the suggested 1 1/2 hours. Worked out very well! Looks beautiful, smells great, Yummy! Thanks for the recipe!!!!!! Do you think it will work if I use raw turbinado sugar instead of white sugar? I think it would work well! Almost done with my first batch! So far, so food! The taste is amazing, that I have tried. My question is, can you double the recipe, and it turn out perfect? I know some you cannot. Oh yay! I’m jealous…I haven’t gotten around to making any this year. Doubling should be fine, it may just take longer to reduce. It will be shelf stable for at least a year provided the lid has been sealed properly. Press on the lid, if it pops up and down, the seal failed and you need to refrigerate and eat within the month. If it doesn’t store in cool place out of the sun and you are good to go. Has anyone used honey in place of sugar and did it work? An elderly neighbor has a peach tree. Saturday he sold them for $2.00 for about 2 dozen small peaches. I bought 3 boxes of them. I canned peaches, but had a bunch left over that had small spots on them. I came across your recipe for jam and it is now simmering on the range. I have been canning for over 50 years, but have never done jam. Though I don’t ave burbon, I did find some peach schnapps tucked away in the back room fridge. It enhanced the flavor so nicely! With your permission, I will add this recipe in my 3 daughters recipe book I am making of many, many things I have canned, baked, cooked. And of course would include your name on it and your blog address. The book has well over 300 pages, and all recipes have photographs. Sure! I’m putting all my recipes into a cookbook for my daughters as well. Glad you liked the recipe! Thank your for asking permission first! would love to have one!!! I love cookbooks & cooking, trying new recipies that I can trust! Would love to make one for my daughter also, how are yo making yours??? Before we moved I started working on it and spent a ton of time with software I got to help ease turning blog posts into a book to publish. Then something went wrong with the software I was using and I couldn’t access ANY of it!! Can’t even begin to tell you how frustrating that was. I was too cranky to pick up working on it right away. Then we moved and I haven’t had time to think about it since moving. I did see that some places like Shutterfly now have Cookbook specific formats. I may check out how much flexibility they have in design. I’ve also heard you can self-publish through Amazon but really need to look into it all more. I hadn’t thought about selling it but maybe I’ll think about that! Will need to re-photograph for higher quality photos of some of the recipes! 😉 Thanks so much for asking! I will definitely post something when I get back to the project. Fall will be a good time for me to work on it. Would anyone know how long to process this recipe if you are canning. Thanks! I did place my jars in a hot water bath for 10 minutes. I am fairly new to canning and had my fear of messing up, but I made this jam a few days ago and it is absolutely delicious. I was not able to find the vanilla bean so I used 1 tablespoon of pure vanilla instead. I cooked mine for about 1 hour and 15 minutes on a slow boil, I used my potato masher to mash the chunks a bit and it turned out amazing. I can’t wait to make another batch. Awesome!! I’m so glad liked it!! If you add a couple teaspoons of butter, it will cut down on the foaming. This makes a clearer jam. Can I leave out the sugar? I have left out the sugar when I had SUPER sweet peaches and made a peach butter instead. I used an immersion blender to blend until smooth. It was delicious!! Thank u. I can’t wait for my peach tree to produce. I’m going to make lots. You’re welcome! I wish I had a peach tree. Enjoy!! Thank you so much for this recipe, it has all of my favourite things (peaches, vanilla, bourbon, and the ice cream that it will inevitablely end up on)! I am looking forward to attempting to make it this weekend. I was wondering how you peeled your peaches though. Did you use the hot then cold water bath method or just simply use a peeler? Any insight would be greatly appreciated! I typically just peel my peaches with a paring knife. Thanks for checking out the blog! Hope you enjoy the jam! I have a fancy but inexpensive tomatoe peeled I got from Sur La Table. It worked perfectly to peel the peaches. So yummy! Wish a had doubled the recipe….maybe I’ll make another batch tomorrow! I did use an immersion blender to get the jammy consistency that I wanted. This is amazing! Mine is still simmering on the stove but I had to sneak a taste and it tastes like peach cobbler but without the carbs in the crust!! Yummy!! Can’t wait to eat some in my yogurt. How would the recipe be altered in order to can it? Pectin. Cook longer? Looks delicious. I’m sorry, since I don’t can it, I’m not sure how to altar it for canning. If you try and are successful I would love to hear what you did and how it worked! No pectin necessary. I just cooked to desired consistency and then processed for jam. Turned out great! This would be great on homemade shortcake with a dollop of whipped cream. This recepe is so ease and very good.. I just made 32 jars of this jam the night before last and it is sooo good! Two jars have already been devoured! It did come out a bit more tart than I expected but that probably had to do with the peaches themselves. Also, it is pretty runny. I might add pectin next time and maybe a little more sugar depending on the over all tartness of the peaches. There will most definitely be a next time! Yum!!! How many jars does this recipe make? Did I miss it in the reading? I just want to have enough jars prepared! Truthfully, we have been so busy during peach season the last couple of years that I haven’t had a chance to make this in a while and I don’t remember how much it makes. Sorry! I THINK it makes around 6 cups of jam. We just moved to an area that has a well known peach growing region nearby so next summer I’ll be making a lot. Right now I’m just trying to get boxes unpacked. ;)- When you make it, please feel free to leave a comment with how much it made! Has anyone thought of adding cinnamon? Is that ok with this and canning? I think that would be really good! It shouldn’t affect the canning at all. OH EEMM GEEEE! Just finished making this and it is to die for! I added Saigon Cinnamon as well as substituting the bourbon with Celtic Crossing which is a honey flavored liqour and it is a slam dunk! A recipe definite keeper – thanks for sharing!! Awesome! Sounds like your additions were amazing. Thanks so much for the feedback. I’m glad you loved it! I don’t have enough peaches so can I add strawberries and how much? I want to try this recipe so bad!! I don’t see why not! Use whatever peaches you have and fill in the rest with strawberries – enough so you have 8 cups of fruit. simmered for the full 1.5 hours and they thickened nicely. Will be making this tomorrow and canning… How many jars does it make? This is terrible but it’s been a long time since I’ve made it and I don’t remember. I’m sorry! I’m hoping to make some this summer though. I hope it goes well! It’s delicious. Mine didn’t get thick. It’s more like jelly, but that’s okay. I bought some English muffins and it soaked into the nooks and crannies just fine. Do you think I could add some tapioca the next time around to thicken it up? I’ve used tapioca to thicken a pie before but never Jam so I’m not sure. Perhaps a little extra pectin? I’ll try that next time. Thanks! Just a couple thoughts. I have seen vanilla paste, what are your thoughts on using that? Also do you think this could be frozen? May be more like a jam when done. Thanks for the great recipe. I’ve never used it, but I may invest in some for future use. Thanks for the heads up! Sounds wonderful! How long can you keep it in frig? I’ve never had it last long enough to find out! (Meaning it gets eaten too quickly. But I would imagine it would be good for 3-4 weeks with all that sugar in it for preservation. What a great idea! So glad the freezing works. Will have to keep that in mind! Has anyone had problems with this setting up? The first time I made it it was fine. But three times since it doesn’t set up and ends up runny. Any suggestions? I would try boiling it down longer. Good luck! I’m sorry it hasn’t worked every time. I wonder if some batches of peaches are more watery than others? Can I use peach brandy, regular brandy, cognac, or rum with this recipe if I don’t have bourbon? Sorry, I’m just seeing this comment! I would imagine any of them would taste great. Sounds delicious. How much does this make? I got 3 pints and change from my batch. I open a jar and cook it over ham. It is so good! I made this recipe today. It tastes wonderful. I made it a little thicker because I am going to use it as a filling for cupcakes. I doubled the batch (someone gave me lots of ripe fruit). I ended up with 12 half pints. Thank you for the recipe. I have made two separate batches of your vanilla peach jam. I did not have the vanilla bean but added 1 tablespoon vanilla from Mexico and used the whiskey. The first batch was with Palasade peaches and the second was made with peaches from California that were picked less ripe. The Palasade peach jam was to die for good. The other jam is ok too but the peaches did not taste as good either. Thanks for sharing your recipe. I couldn’t agree more! The quality of your peaches is what makes or breaks this recipe. Glad you got one to-die-for batch! I tried this in my crock pot on high tiil it boils then on low over night (11pm -7:30am) put in jars b w b 15mn. It worked great. Less mess less stirring. I managed to hide1 jar, the rest was gone after breakfast the next day. This is good to know! Thanks for sharing!